Due to erratic Spring weather and the general busyness of farm life, finishing the end walls of the hoophouse has taken longer than expected. I am very happy to report that we have finished the exterior portions of the building project and the structure is all closed in! Before an expected lengthy spell of heavy rain, a drain pipe was installed in the ditch on the uphill side of the hoophouse. The intent is to carry the rainwater that will be coming off of the roof as well as any run-off from the garden above away from the site. The drain was thoroughly tested over the following week and it works well! When the weather finally got around to cooperating we got busy closing in the building by installing the clear, single wall, polycarbonate sheets on the end walls. 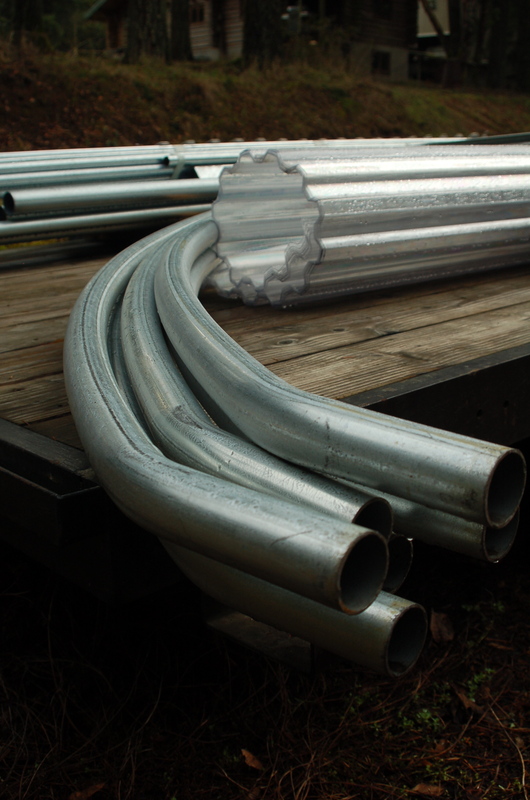 The polycarbonate is lightweight, tough and fairly easy to cut and install. We found a heavy weight pair of shears cut the polycarbonate both with and across the corrugations pretty well. The sheets are four feet wide so most of the sheets had multiple cuts for the arch of the bow as well as openings for the shutters, exhaust fan and doors. By holding the sheet in place we were able to draw the cutting pattern onto the sheet with a sharpie marker, then remove the sheet and place it on sawhorses to do the cutting . To attach the sheets to the wall we held them in place, pre-drilled the polycarbonate and then attached the panel to the underlying metal frame with self tapping screws and washers. Starting at one edge, and overlapping the sheets by one corrugation, we progressed across the width of the building, finishing up with covering the door frame. Once the south wall was covered with the polycarbonate we finished off the edge where roof meets wall by taking the overhanging edge of the poly roof covering , rolling it upon itself and screwing it to the vertical edge of the polycarbonate. This made for a tidy way to close the gap between the two materials and the two surfaces. After many delays we moved on to the north wall by first installing the exhaust fan in the gable above the door. Then using the same procedure of fitting, cutting, pre-drilling and attaching the polycarbonate we enclosed the second end wall. The final step to completely closing in the hoophouse was to roll the poly roof material over the edge and screw it to the polycarbonate wall just as we had on the south wall. The end walls are finished and the hoophouse project is nearing completion. Next we move indoors. You can follow the steps in the photos below. Just click on the photo to see the brief explanation. Hope you have enjoyed following our building project. 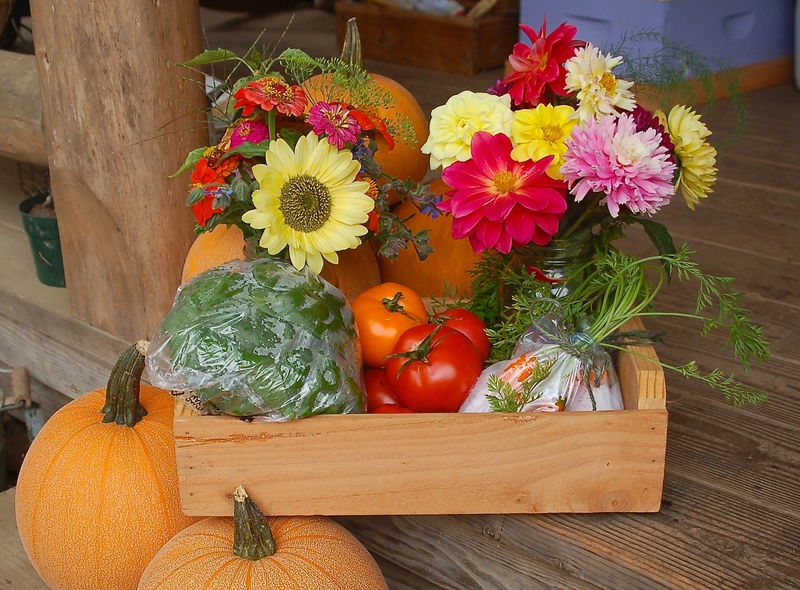 Is there a hoophouse in your future? The stars were aligned, the poly gods were smiling and Murphy took a break. We had a warm sunny day, no wind, the dew had evaporated & my faithful crew, husband Bob & son Will were available. The long anticipated day had come; it was time to pull on the poly cover! 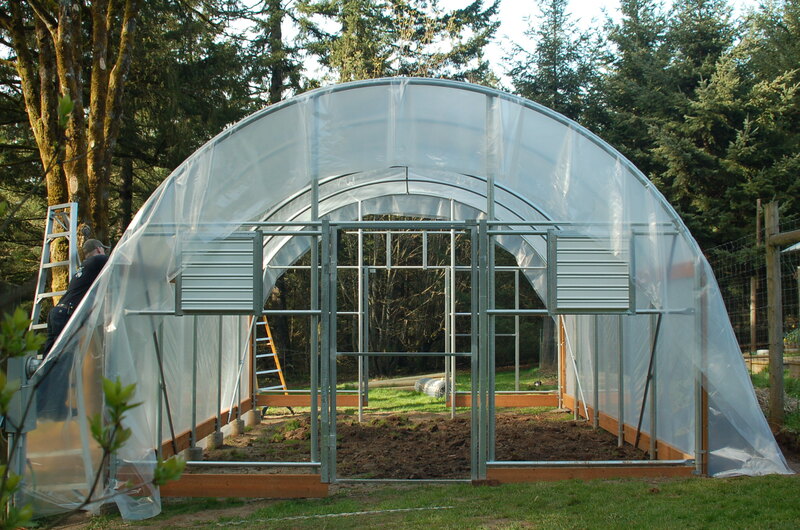 We are using a double layer of poly for the roof and sidewalls of the hoophouse. 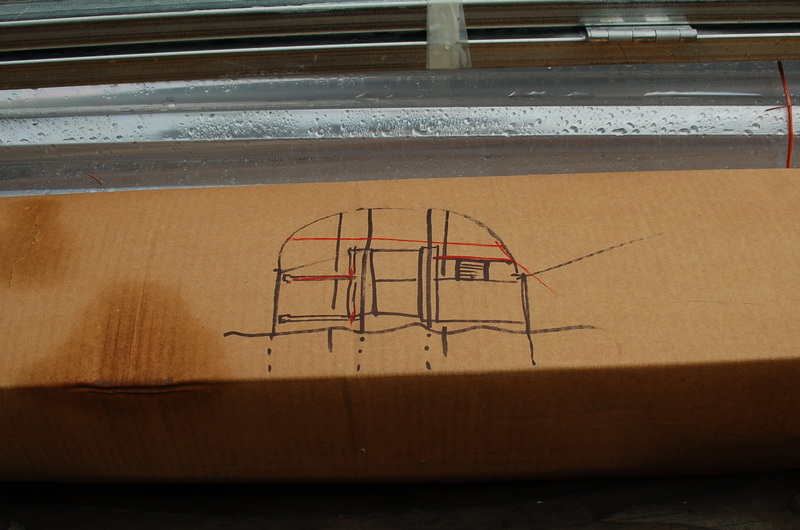 It will be inflated with a small fan, forming a pillow of air that will provide extra insulation. We decided to pull both layers on at once so we cut a double length of poly and folded it in half to get the 2 layers. We then accordion folded the full length of the poly and placed it at the base of the downhill wall. Tennis balls were then tied inside the fold of the poly with ropes, one at each end and one in the middle. The ropes were then tossed over the top of the house to the uphill side for pulling the giant poly sail up and over the frame. With the three of us, each on a rope, we easily pulled the large piece of poly up and over to the opposite side. We used the ropes that were still attached to the poly to tie the uphill side to the sill board. We then manipulated the large sheet into position, pulling the excess over the edge of the end walls. Starting at one end and up at the ridge pole we began attaching the poly to the end channel with wiggle wire and worked our way down to the sill on each side. 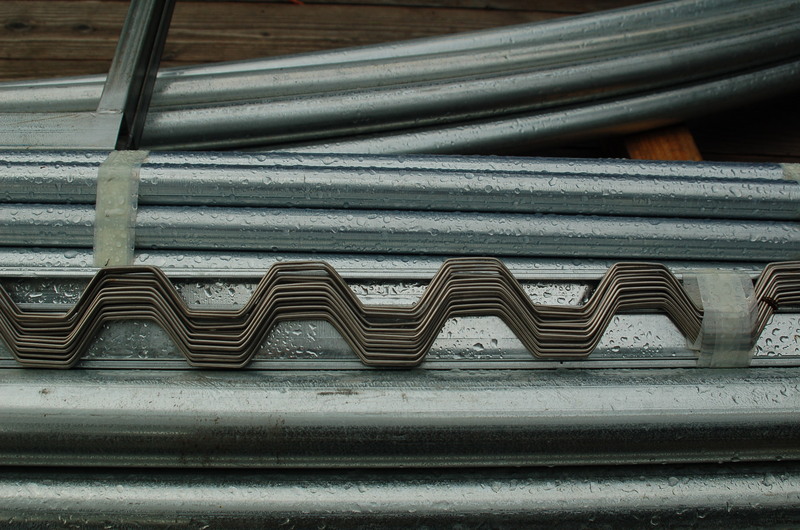 Wiggle wire is a terribly simple & ingenious invention that holds the poly covering to the frame. After the one end was locked into position we went to the opposite end & pulled the covering taught the length of the hoophouse. Once again starting at the ridge pole and working down each side to the sill placing the wiggle wire in the channel. The ends were now secure so we then proceeded to attaching the poly to the channels on the sill boards. The last attachment point was the channels on the hip boards. The poly cover is now in place. Thanks crew, you guys are the best! There are more steps to go to get the hoophouse completely enclosed and ready to use but we feel like a major step is behind us. You can follow the steps in the photos below. Just click on each photo to read it’s caption. Please come back again and follow our progress. 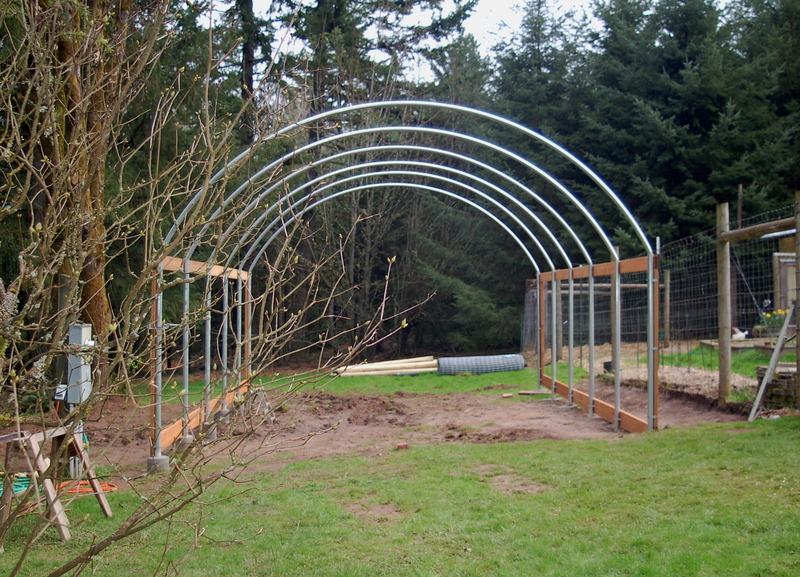 Last week we were able to catch a dry day here and there and finish up the hoophouse frame. Installing the poly lock channels, which is the device that actually holds the poly covering to the frame, was fairly straightforward. Care was taken that the channels were level on the sidewalls, centered on the top of the end bows and met at the corners. A preliminary to attaching the poly channels was to remove the sharp corner at the end of the hip boards, making it rounded to facilitate a smoother transition from the vertical wall to the curve of the end bow. To do this cuts were made with a backsaw and the smoothing of the curve was done with a chisel. We began by installing the horizontal runs of channel on each sidewall. A run of channel was screwed into place the length of each of the sill and hip boards. The vertical runs of poly channel were then installed up from the sill on each of the outside corners and bent to follow the curve we had chiseled out. The channel, centered on the bow, then continued over the top curve of the end bows until we had a continuous channel from one sill over the top of the arch and down to the opposite sill . We flattened the ends of the horizontal channel at the corners where it met the vertical so there would be less likelihood of the poly catching on any sharp edges and tearing during it’s installation. When all the channels were in place we finished by attaching a sill board on each side of the door on the end walls. This board will help retain the soil as well as keep soil from pushing against the bottom edge of the polycarbonate end walls. Lastly, a drainage ditch was dug on the uphill side of the hoophouse to carry rainwater runoff away from the house and also to keep any water from the garden above from running into the house. You can follow these steps in the photos below. Just click on the picture to see it’s caption. On the next dry, warm and calm day we will pull on the poly covering. We are so close! Please come back and check on our progress! March is an interesting month here in Northwest Oregon. Brilliant sun one moment, drenching rains the next and then for a little variety sometimes you get both at the same time! 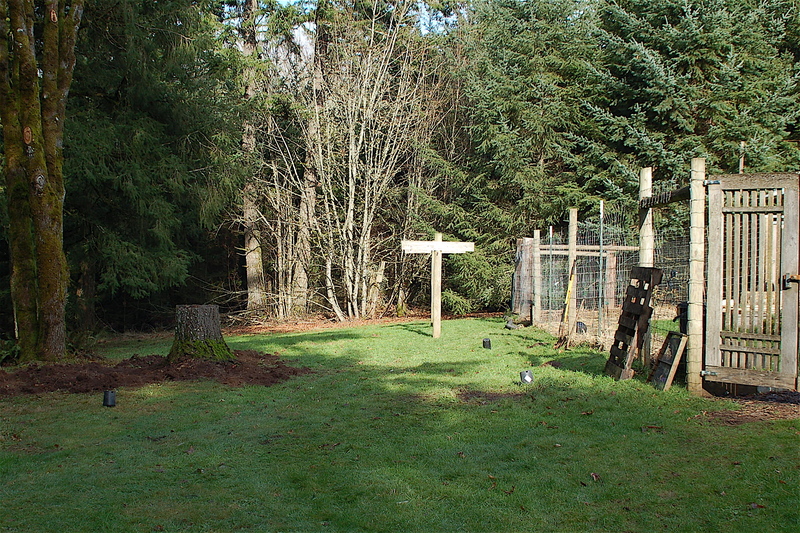 Lucky for us we recently had a run of several beautiful dry days in a row so back to the hoophouse project we went. Picking up where we left off we began by installing bracing on the sidewalls at each of the four corners. Diagonal braces run from the bottoms of the outside bow, past the 2nd wall post and down to the sill board. With each addition the structure gets more & more rigid. With that mission accomplished we turned to constructing the end wall frames. First posts were set vertically into concrete on each side of the door openings and then fastened to the bows at their tops. After letting the concrete set for a day, the top of each post was cut off, with an angle grinder, to the same height as the top of the bow. The rough edges of the cuts were then ground smooth to minimize any chance of catching & ripping the poly covering when it is later pulled into place. Horizontal pipes were then installed on each side of the doorway opening at sill & shoulder level. Once installed the ends of those pipes were cut off plumb at each side of the doorway allowing enough room to center the door frame in the opening. The door frame sides then slipped over the ends of the pipes and were screwed into place, with the sides plumb, the tops level and the bottoms at finished grade level. On the final evening before the rains returned we were able to hang the frames of the doors in place. You can follow the process in the pictures below. When next the weather cooperates we will move on to installing louvered intake shutters on each side of the door on one end and an exhaust fan on the gable above the door at the other end. Lastly we will install sill boards at the base of the end walls and then install the channels that will ultimately hold the poly covering in place. At that point the frame should be complete. We are so close to pulling the cover on… which is a good thing as I am quickly running out of room for flats of seedlings under the grow lights in the house! Please return for more of the continuing story! Bob & I have a lot of prior building experience. Starting back in 1985 we designed & built our log home from trees we harvested from our property. More on that story in a future blog post! 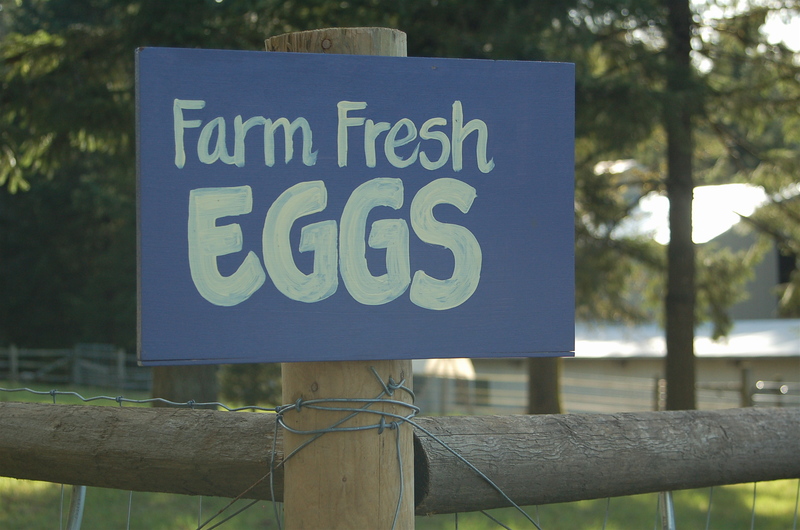 We have, over the years, also constructed our barn, built from lumber milled from trees on the property, and multiple farm buildings. 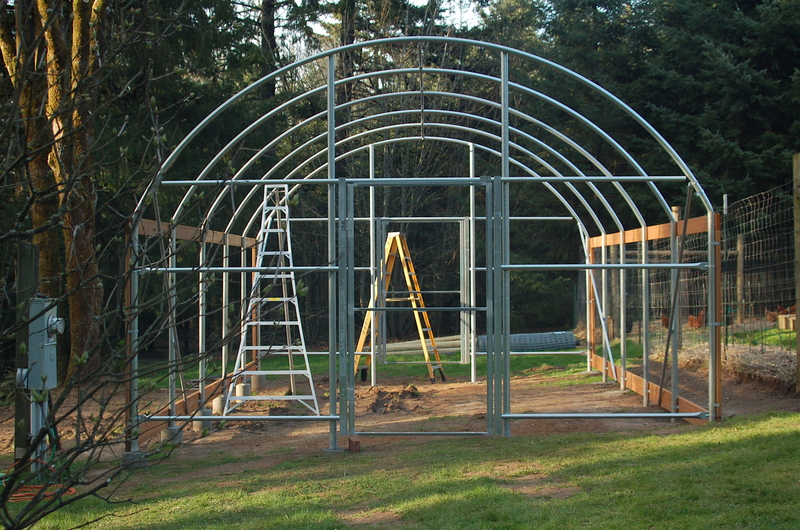 Though we have no experience building a hoophouse we do possess the general construction skills needed to be successful. It is by far an easier project than building a log house but has not been without its challenges. The largest challenge has been figuring out how to construct the hoophouse on a site with compound ground slopes. Once a decision was made to have the floor inside of the house level, both front-to-back as well as side-to-side; we needed to figure out how to accomplish that. Using the highest outside grade point as our guide we decided to build up the low areas so that the final hoophouse floor would be above outside grade and would drain well. This also meant up to 10” of fill would need to be added at the lowest points. After shooting a level floor grade with a transit we plotted out the position of each post and got the building square. Next we determined the height needed to set each of the 6’ wall posts to get all of their tops on the same level plane. With post positions marked and hole depths calculated we augured 9” holes for the concrete bases for each post. Finally we got down to the job of setting the 6’ wall posts. 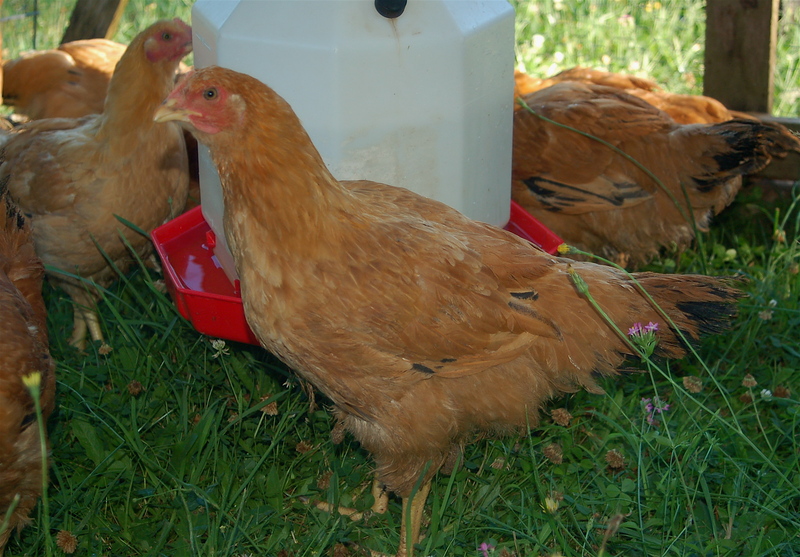 Over multiple days/weeks due to weather/mud & life/farm constraints we began building. We set the corner posts first; to be plumb, square and with tops on a level plane, bracing as we went to hold the positions as the concrete set. Later we filled in with the line posts keeping each on center, inline, plumb and on the same level top plane as the corner posts, once again bracing as we went. This process was actually quite challenging. I am happy to report we have success! The wall posts are all installed and they are square, plumb, inline and level! As in all building projects getting the foundation started correctly is paramount. Placement of the roof bows was not terribly dramatic being lifted and slid into place by the two of us. Yesterday we completed stabilizing the sidewalls by attaching the sill and hip boards and completing the box with uprights in the corners. You can follow the steps in the photos below. On the next available dry day we will move on to installing the ridgepole, bracing and the end wall frames. There is definitely a hoophouse in our near future! Please check back to watch our progress! 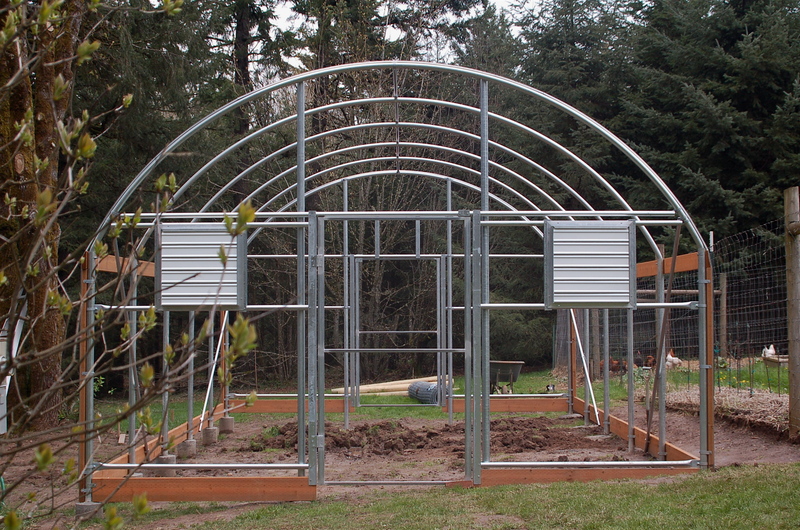 Third in a series of posts on our adventures of building a hoophouse on the farm. Picking up the hoophouse order was delayed by a week due to the great snow storm of February 2014 that dumped 15 inches of beauty on the farm. Even after the country road we live on had cleared it took another 2 days before we could get our flatbed trailer out the driveway. Snow is beautiful… the melt off not so much. 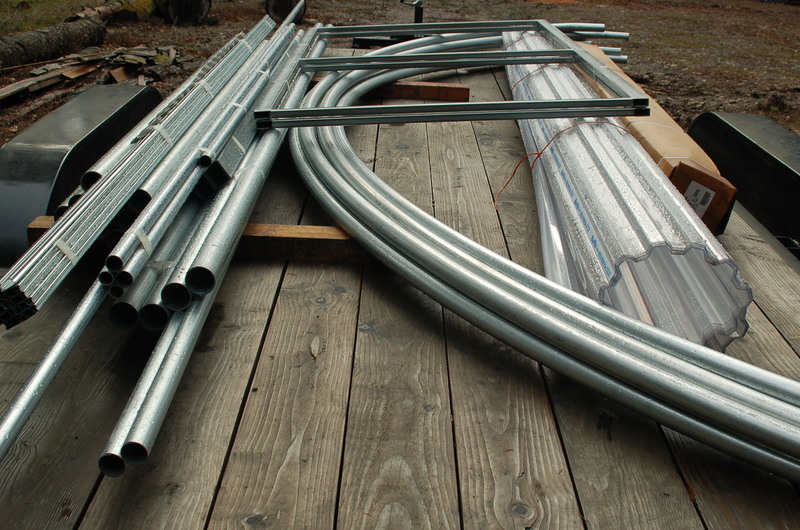 The hoophouse kit parts are still on the flatbed trailer, but now at least they are at the farm. We are awaiting a series of dry days to start the building process. So far Mother Nature is failing to cooperate with the best laid plan. Meanwhile the plan of attack has been honed to perfection, the instructions have been read and almost understood, the builders are ready, the tools are ready, the site is muddy & the rain keeps falling. We will return to this fine compelling story once we get some cooperation from the weather and we actually have something to take a picture of! Thanks for visiting & please come back! 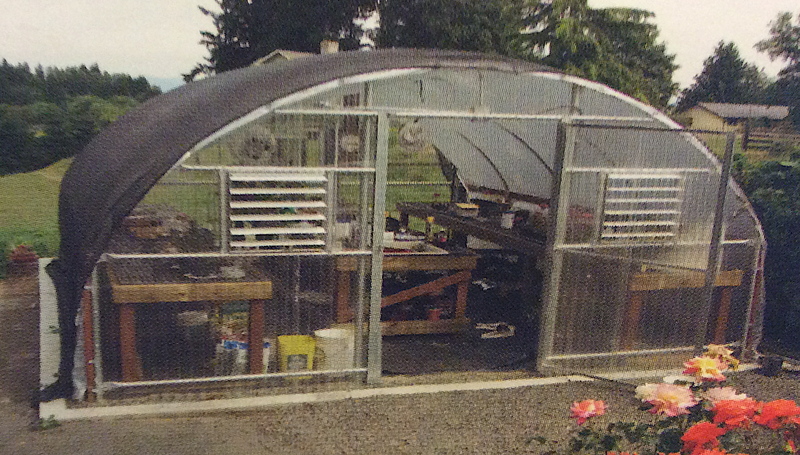 A kinda- almost replica of the Hoophouse we ordered from Oregon Valley Greenhouses, Inc..
#1 Research every conceivable option available using every source known to humankind. #2 Talk to everyone that has a Hoophouse. Ask lots of questions. Visits are ideal. 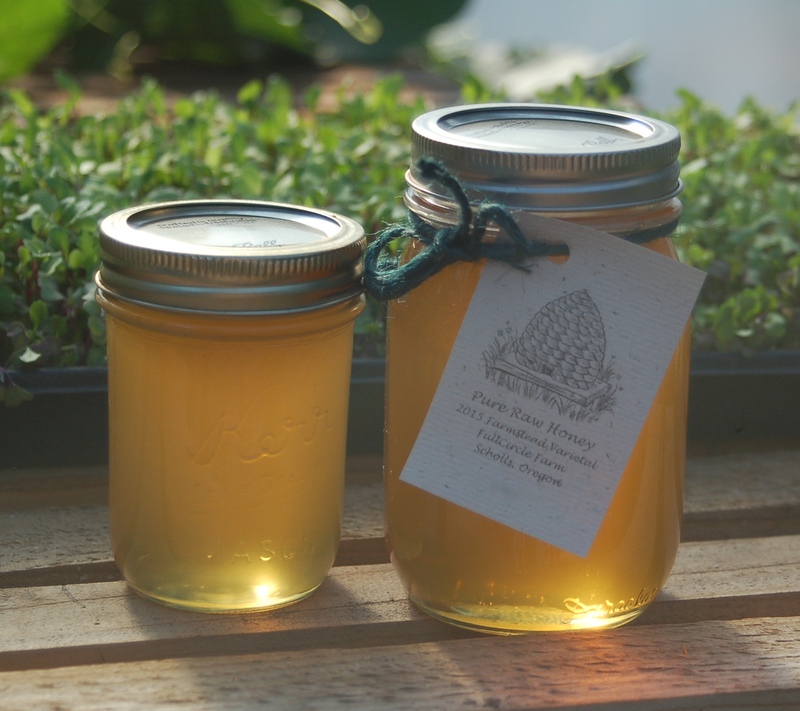 #5 Visit them, look at their products, ask yet more questions. #6 Go home, mull it over & over some more. Eventually chose the best options available that fit your needs & your site. #7 Check the budget. Check in with the building crew, bring home baked goodies. In my case this is Husband Bob & Son Will. Thank them profusely for their undying loyalty to you and your latest project. #8 Order the DARN thing…..
#9 DONE… Kit parts to be picked-up in 2 weeks. #10 Now back to the hole… Uhm the work site. 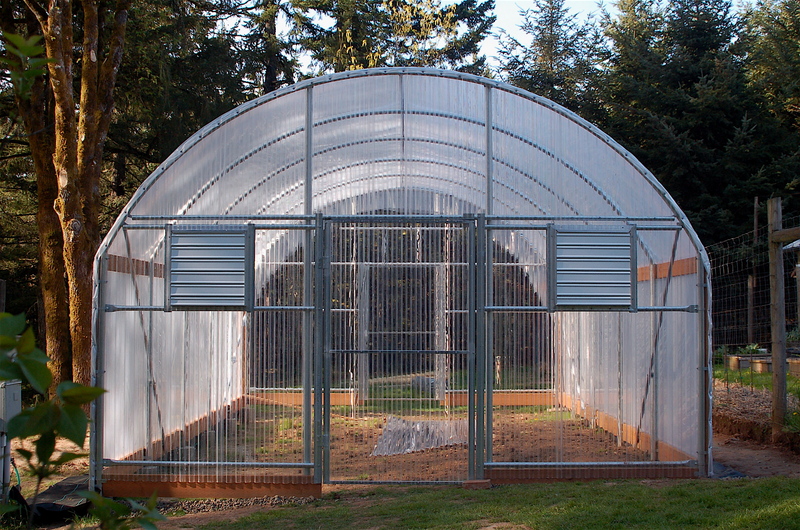 This year our large Spring project is to install a small hoophouse on the farm to use for seed starting and season extension. Sometimes it is easy to picture the final project but much harder to see all of the steps it takes to get there. We chose the best location for sun exposure, slope of the land, access to water and power and close proximity to house and garden. 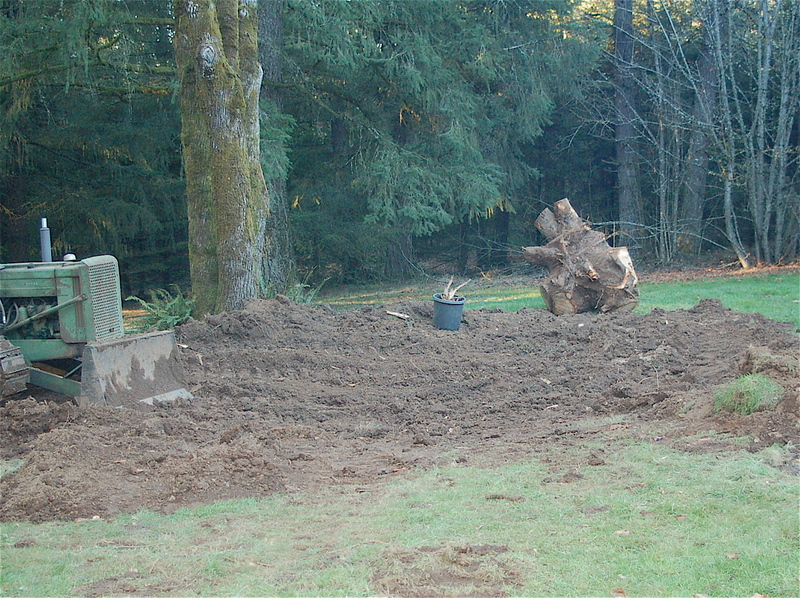 The next step, and the one chronicled here, was to remove a sizable fir tree stump that was to close to the site. 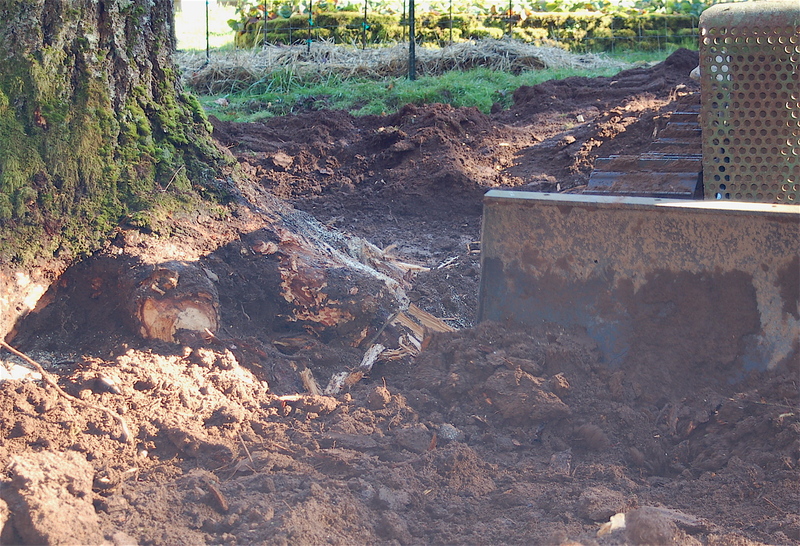 Digging out a stump is a big, no a HUGE, job. They say a tree is as big underground as above- Well they don’t lie! So you start to dig, accessing uppermost roots, then you dig some more. 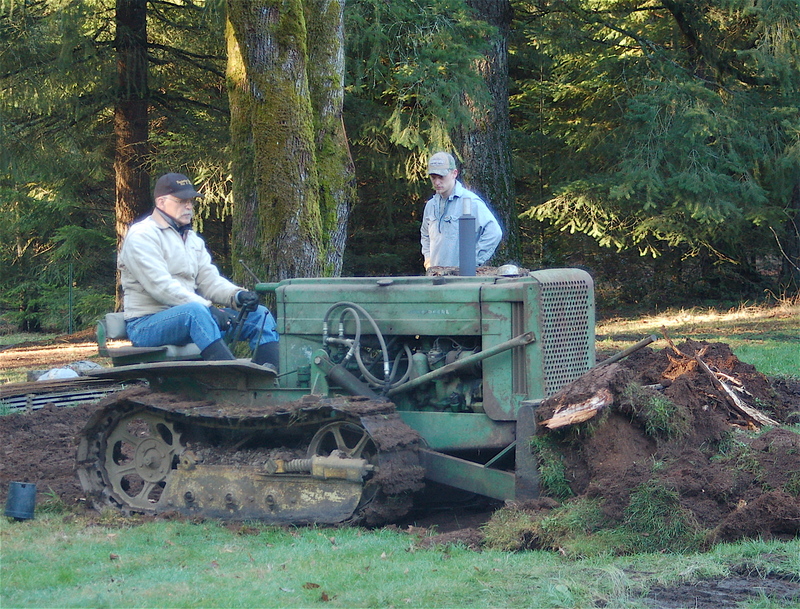 Then you bring in your trusty vintage John Deere crawler and dig some more. 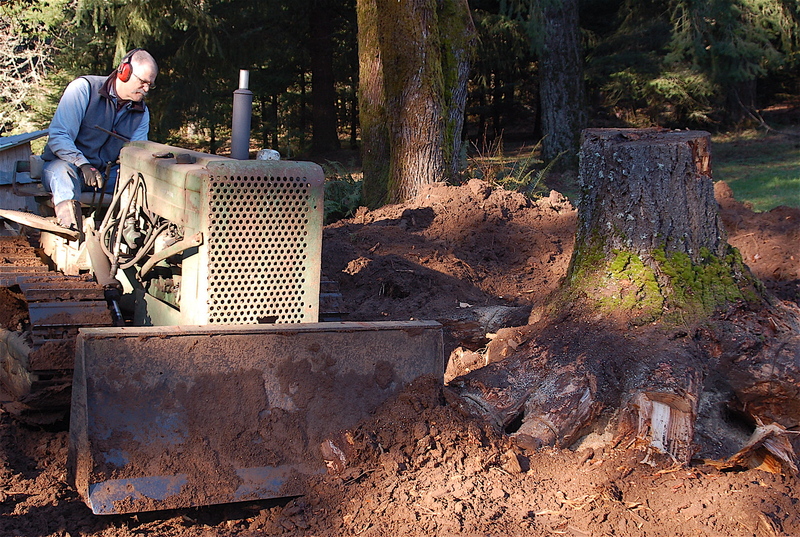 Then you use your best friend the chainsaw and cut said roots so you can access some more sizable roots. For 4 days we followed this routine. The hole grows ever larger. 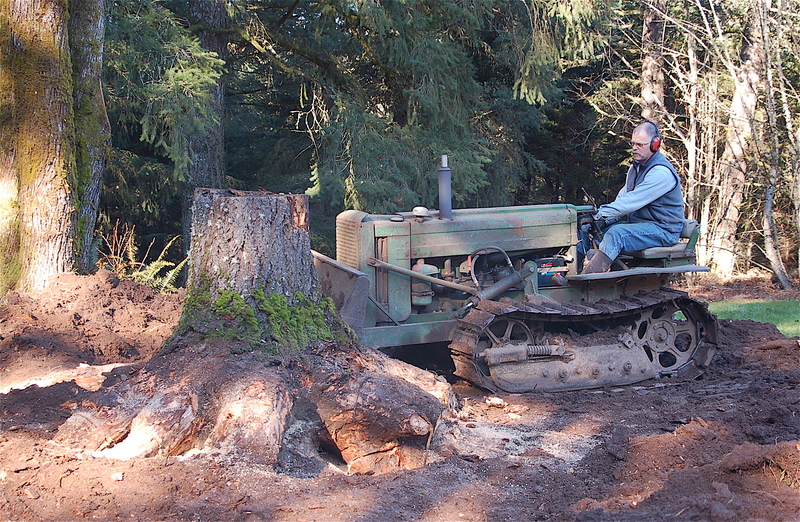 Then you think ‘I wonder if the crawler can push or pull this stump over’. It can’t… so you dig and cut some more. 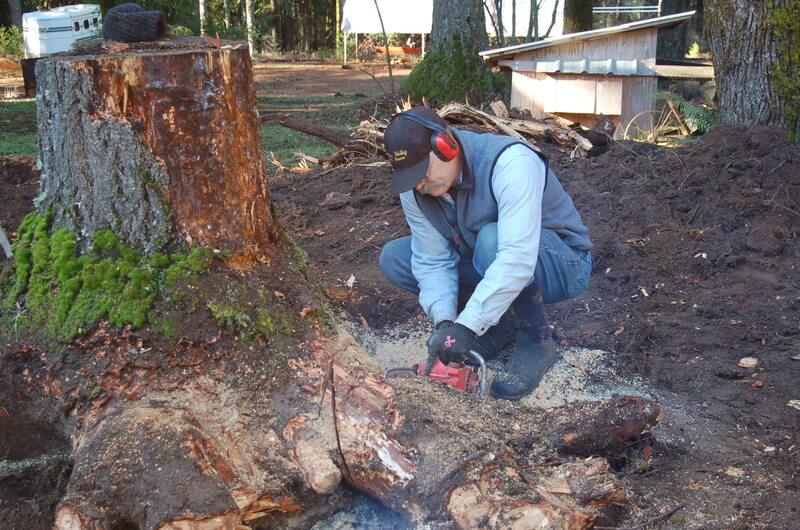 Then you find that magical root that is holding the whole stump in place and Wha La, the stump pops from the ground. Success at last!